Deals and Details: Black and gold are a classic combination in my book. 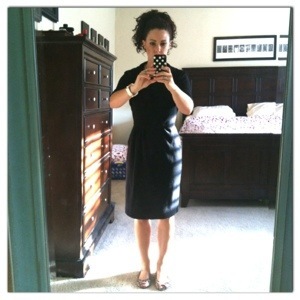 I love this dress, the fit is perfect and the price was fabulous! When it is warmer, I won’t wear the shrug, it has a great neck line and I love the way the sleeveless sleeves are finished. I found these adorable flower stud earrings at Target, clearanced of course! I couldn’t believe my luck because I had been admiring a similar pair, shown in my splurge set from Bauble Bar for $24! I look to Polyvore a lot to figure out how to wear items I already have. If you haven’t checked out Polvore, be warned it is very addicting. I would describe it as a shopping and fashion website that has a feature to create “sets” or “looks” that reminds me of digital paper dolls! Have a great day! Stay fabulous and be frugal! Next Post Enjoy Your Weekend!